« Keith and Helen’s olive oil wins top prize! A new Masthead for the Blog! 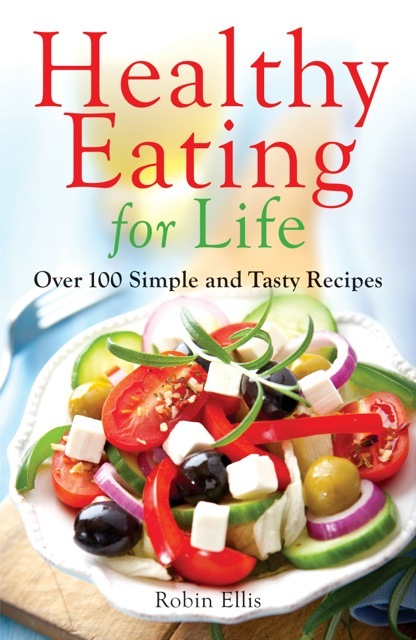 …heralding my new book, Healthy Eating for Life! Sounds like something handed down by a crusty old judge–a life sentence of eating humble pie for past sins. This book is not promoting a diet of worms, grapefruit or any of the strict rule-ridden diets that are so guilt-inducing and hard to stick with. It’s a book for people who love good food and enjoy cooking it or at least are willing to try. All manner of food, cooked in all manner of ways—a balanced diet, avoiding extremes. Already on my Amazon wishlist! Pre-ordered! (Why wait?) As for the humble pie — heck, if you had a recipe for it, we’d cook that, too, Robin. LOVE the cover! Can’t wait to see what’s inside! Congratulations Robin! BEAUTIFUL Masthead!!!! CONGRATULATIONS!!! CAN’T WAIT TO PURCHASE MY COPY – IN CHICAGO! Lea Frey , just an 86 year old lady from California. I want the recipe for the cover! It looks scrumptious. Can’t wait. Greek salad–in the book–not sure which page! I’ll be there! Weather permitting! I’ll have to buy two copies this time as my son made off with the original copy of Delicious Dishes. Thank you for letting us all know about the book signing. I’m actually due to arrive in London by Eurostar on the morning of 16th January but probably have to be somewhere else by late afternoon. I’ll take another look at the diary. Anyway, congratulations on the imminent arrival of book number two. I have preordered 2 of your new cook books. One for me and one for my dear friend who diabetic. She loves your Delicious Dishes as do we. Thank you for your labor of love. Thanks Ellen–happy to hear your friend (and you) find the book helpful. This looks WONDERFUL ROBIN! I think I will order this for my new home! I will dislpay it proudly with my other 8000 cookbooks. But a cookbook from “Poldark” is special! Will you be doing a tour in the US? If you do, please come to Chicago and Los Gatos, California! Lea Fredericks Frey and I (+ thousands more!) would love to meet you & Merideth in person – and Merideth can revisit her beloved home city! If you’re reading this, Lea, like Robin, myself, and so many others – we are sending you our sincere sympathy for your great loss. God Bless you, Lea. And remember, you are not getting older, but wiser – and more wonderful like fine wine!